Subscribe to my channel to watch it when it comes out! These 2 weapons are perfectly made for each other. They have great synergy in both boons and conditions. For this build you will be constantly swapping your weapons back and forth. This will allow for great conditions on your target and good boons for you. Your primary weapon will be the Longbow. Most of the time you will kite and fire upon your enemies with the longbow. Your burst damage will come from this weapon. With the Battle Sigil you will be able to keep your 3 stacks of might up the entire time by switching weapons back and forth! Switching the Shortbow will enable you to put quick DOTs on your targets and with the Hydromancy Sigil you will be able to freeze your opponents around you for a great escape! These 2 8-legged freaks are absolutely AMAZING! They will provide you with not one but TWO CCs! Entangling Web will immobilize your opponent for 3 whole seconds! This will enable you to get away quickly and do some serious damage! After your opponent is freed from Entangling Web, stun them with Paralyzing Venom! These 2 CCs are a deadly combination! Exploit them while you can! Poison Gas is a great DOT but what’s better is that it acts like MS (Mortal Strike from WoW) and lowers the effective healing on your opponent by 33%! This skill is by far the best healing skill for Rangers. You will get a somewhat big heal followed by regen from the healing well that forms on the ground. And best of all you get condition removals from Healing Well’s additional effect! This is very situational and player oriented. If you are afraid of melee classes or range (physical damage) you might want to go with Signet of the Wild. To go against DOTTers go with Signet of Renewal to help remove conditions. If you have too many conditions on you, then activate the signet to transfer them to your pet! Even thought Signet of the Wild only 62 heals / sec, it will add up greatly when you are running w/ compositions that also offer small heal ticks such as this. This also pairs greatly with the rejuvenation trait that you will get for this build. This skill and the rejuv trait is good synergy with each other because you need to keep your health above 90% for the 10% more damage bonus to attacks. This will require a lot of kiting / dodging / moving the entire time! This is what you should do as a ranger anyway. This signet is a must for this build. A 6 second bubble is too good. This is extremely useful for when you get ambushed by a thief or a charging warrior. Please keep in mind that this bubble only absorb physical damage. Not DOTs! But then again most of the time, you will only be caught off guard with crazy burst damage from physical damage rather than condition. More on this in the strategy below. This is the best signet! YOU SET IT! AND FORGET IT! The active ability of this signet is NOT even worth it to use. I don’t even have this skill binded! And since I’m not a clicker, this skill will never be used! The 10% increase movement speed is extremely crucial for kiting. Do NOT leave home without this. This skill is potent to this build. Not only it allows you to get away from CCs but it helps you burst down your opponent and gives you a quick getaway speed! These boons last pretty long as well! With the stability swaps between this skill and Signet of the Wild you will have at least one stability boon to help get away from thieves! These traits put another condition onto your target along with the 2 conditions (DOTs) when you initiate the fight with your shortbow. This is the pre-burst set up needed for your Longbow Burst! This is a must! You are running a signet build and this will lower Signet CDs by 20%! No brainer. Derp. This is a really good trait to have. Since you are running both types of bows, all your attacks will be arrow projectiles! So ALL of your attacks will pierce and hit whatever is behind your target! If you do not have this trait then this Signet Build will not work. This is the backbone of this build. It makes it so that all effects of signets also affect you! Another no brainer. Derp. After you are done putting Conditions and DOTs on your target swap to your Longbow and you will gain 3 stacks of might from the sigil, faster movement speed from Tail Wind, AND fury (crit) from Furious Grip. This will provide you with crazy burst damage and will enable you to chase down your opponent! Since you will have 44% crit for this build, it’s good to have another condition available to provide more damage to your target! This trait is a must if you want to keep your 3 stacks of might up! Ultimately you will want your shortbow’s cooldown to be up when you swap over. Same thing with longbow’s cooldown! This trait will also increase how often you will able to burst down your opponent. Rejuv is good synergy with Signet of the Wild. Those heals will add up to help counter condition DOTs. Fortifying Bond will definitely give more damage to your pet and help it survive. Remember, you are gaining quite a few boons! Since sine you will be using runes with a lot of power, you will want the added power from Strength of Spirit. Nature’s Protection will protect you from the quick bursts. This will enable to able to react when thieves pop out of stealth and start bursting on you. You will be able to pop either your stability signet or your stone signet for a 6 seconds immune to physical! Critical Strikes with high critical damage % will contribute to the burst damage as well. 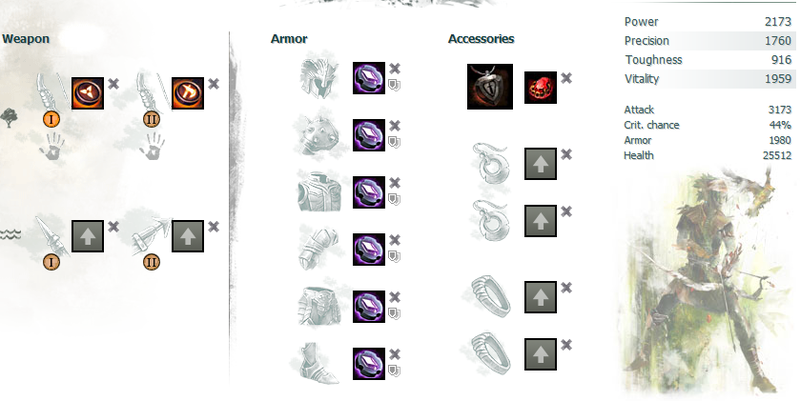 For runs and accessories you will want to go with power and crit damage. 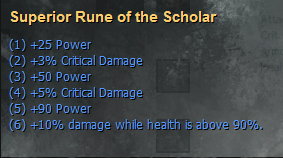 The 6 piece from Superior Rune of the Scholar is great if you can keep your health above 90% – As for your amulet you will want Knight’s Amulet with a Berserker’s Jewel in it! Overall you will have great health, high damage. You will need to coordinate and time your utility skills correctly in order to survive. This is a glasscannon build that smart people will use. It has tons of survivability when timed and played correctly.